Meet the author of 100 Years in the Life of an American Girl. Are you in the Bay Area on Saturday March 14, 1:30 – 3:30? If so, please drop by the Petaluma Copperfield’s Bookstore, a Meet & Greet where I’ll have a table near the entrance and I’ll be saying hello and signing books. San Rafael Copperfield’s is hosting a second author Meet & Greet, Saturday March 28, 1:30 – 3:30. Petaluma is 45 minutes north of San Francisco on Hwy 101 and 30 minutes south of Santa Rosa. San Rafael is just across the Golden Gate Bridge, in Marin County. Independent bookstores like these have to be applauded for all they do, serving people who like the feel of the weight of a good book in their hands and like to turn its pages and see the photos up close. San Rafael Copperfield’s knows how important coffee is, too. They have a cafe in the store, and tables. I don’t know about you, but for me good writing and good coffee belong under the same roof! 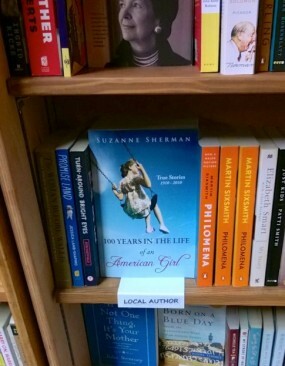 Besides these Copperfield’s bookstores hosting author events in Petaluma and San Rafael in March, 100 Years in the Life of an American Girl is now available at Copperfield’s Santa Rosa, Copperfield’s Sebastopol, Copperfield’s Napa, and at Milk & Honey in Sebastopol. Be sure to stop by and get your copy next time you’re in any of these areas in Northern California. Buying the book in the bookstore has important ripple effects.